Russian city; capital of the government of the same name; situated on the right bank of the Dnieper, near its mouth. It was founded by Prince Potemkin in 1778. When permission was given the Jews to settle in New Russia by a ukase of Nov. 16, 1769, a number established themselves in the district which later included Kherson; some of these were among the first inhabitants of Kherson. By 1781 the Jews in Kherson had become numerous enough to organize a community, and the pinḳeses show that the by-laws of the ḥebra ḳaddisha were prepared in that year. According to these records, the head of the brotherhood was elected for life, and the governing body was chosen from among the members by ballot. From 1839 to 1859 there were ninety-three members. When a commission was organized (Aug. 1, 1840) in Odessa by order of the government to consider the feasibility of establishing the office of government rabbi, the Kherson community voluntarily elected Moses Warshavski, a local merchant, as delegate to represent it before the commission. 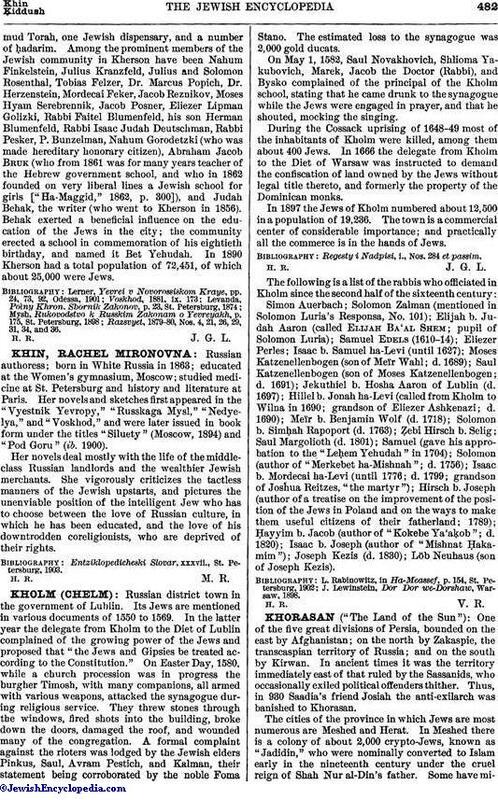 According to the official report (1856) of the "learned Jew" Marcus Gurovich to the governor-general of New Russia, there were at that time in the city of Kherson eight Jewish prayer-houses, including one large new synagogue, one Talmud Torah supported by private funds, and one Jewish hospital supported partly by the contributions of the wealthy merchant Feker and partly from funds derived from the basket-tax. The Talmud Torah was founded in 1860; its course of instruction at first included Hebrew subjects only, but later, owing to the efforts of the young rabbi, Faitel Blumenfeld, a graduate of the Jitomir rabbinical school, was expanded to include the study of general non-Hebrew subjects. In 1865 Blumenfeld succeeded in adding industrial classes to the Talmud Torah, and in 1867 he secured permission to open a technical school in Kherson, though, in consequence of the indifference of the community, it was never opened. The income of the community in 1881 from its meat-tax was 31,000 rubles; from this sum 3,800 rubles were assigned to the two large synagogues, and an equal sum to the ten prayer-houses. A fixed proportion of the meat-tax was assigned for the use of the Jewish hospital. On Oct. 6, 1881, a commission of twenty-eight, appointed to consider "the Jewish question," was convened in Kherson. It included three Jewish members—Dr. Zetkin of Yelisavetgrad, Blumenfeld of Ananyev, and Bunzelman of Kherson. In a paper presented to the commission by the Christian merchants of the government, the latter praise the Jewish agriculturists of Kherson as peaceful and honest neighbors, who till the soil by their own labor, show no disposition to evade military service, and are seldom guilty of insubordination. They perform their duties faithfully, and furnish the smallest proportion of criminals. The commission voted in favor of permitting to Jews unrestricted rights of residence throughout Russia. The Jews of Kherson have contributed to the development of the trade in timber and other forest products with White Russia, and have been influential in the expansion also of the export trade in grain. In 1881 there were in the city 4 Jewish merchants of the "first gild" in a total of 6; 66 Jewish merchants of the "second gild" in a total of 136; 55 Jewish merchants licensed for retail trade in a total of 134; and 54 Jewish clerks in a total of 139. Of the 40 lumber-yards of Kherson, 36 were owned by Jewish merchants. The lumber trade in 1880 amounted to 2,500,000 rubles. The members of the Kherson community are distinguished for their progressive spirit and their recognition of the value of a modern education. In 1899 Kherson had eight prayer-houses, five synagogues (one of them Karaite), one Jewish technical school, one TalmudTorah, one Jewish dispensary, and a number of ḥadarim. Among the prominent members of the Jewish community in Kherson have been Nahum Finkelstein, Julius Kranzfeld, Julius and Solomon Rosenthal, Tobias Felzer, Dr. Marcus Popich, Dr. Herzenstein, Mordecai Feker, Jacob Reznikov, Moses Hyam Serebrennik, Jacob Posner, Eliezer Lipman Golizki, Rabbi Faitel Blumenfeld, his son Herman Blumenfeld, Rabbi Isaac Judah Deutschman, Rabbi Pesker, P. Bunzelman, Nahum Gorodetzki (who was made hereditary honorary citizen), Abraham Jacob Bruk (who from 1861 was for many years teacher of the Hebrew government school, and who in 1862 founded on very liberal lines a Jewish school for girls ["Ha-Maggid," 1862, p. 300]), and Judah Behak, the writer (who went to Kherson in 1856). Behak exerted a beneficial influence on the education of the Jews in the city; the community erected a school in commemoration of his eightieth birthday, and named it Bet Yehudah. 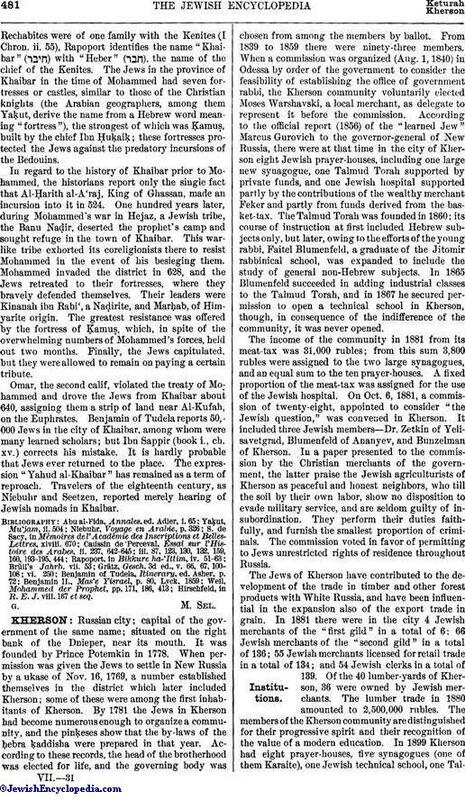 In 1890 Kherson had a total population of 72,451, of which about 25,000 were Jews. Razsvyet, 1879-80, Nos. 4, 21, 26, 29, 31, 34, and 36.